If you have ever visited the Vatican, you have seen the stoic guards that look like they missed the bus to the local Renaissance Festival. The truth is they are a high-end military force made up of top ex-Swiss soldiers. And don’t let those spears fool you, they can shred you to pieces with them. If that doesn’t work, they have one of the finest firearms collections on the planet to finish the job. The Pontifical Swiss Guard is over 500 years old, making it one of the oldest standing military units in the world. Founded officially on January 22nd, 1506 by Pope Julius II, at the time the Swiss Guard was really a mercenary force. Back in the 14th century, Swiss fighters were knows to be some of the best anywhere, renowned for their ability to take on far larger armies and win. In the 1400s, Swiss mercenaries proved themselves in battle time and time again, sometimes while fighting for the Holy Roman Empire. In a way, their small footprint with big results was a precursor to today’s elite special forces teams. The Swiss Guard’s first major engagement, and the one that proved the force’s dedication and abilities, occurred on May 6th, 1527. Emperor Charles V’s soldiers were in the process of sacking Rome when they attempted to invade Saint Peter’s Basilica. There the comparatively tiny Swiss Guard force held back a massive onslaught long enough for Pope Clement VII to escape through a half-mile long secret passageway inside the Passetto di Borgo, to Castel Sant’Angelo, a large fortress nearby. He held out for eight days before surrendering, and lived to talk about it. Nearly 150 of the 189 guards serving at the time gave their lives to see that the Pope survived. This incredibly brave stand, one where death was certain, defines the Swiss Guard’s devotion to protecting the Pope at all costs — an ethos that still exists to this day. The Swiss Guard also happens to be the smallest army in the world with only about 110 to 125 soldiers and officers serving at any given time. The basic requirements to apply are pretty straightforward. You must be a Swiss man, younger than 30, at least five foot eight inches tall, and have served with the Swiss military with good merits. You must also be Catholic and at least have a diploma. You also must be single, although you are allowed to marry if you are at least 25 and have served three years already and commit to another three years of service with a rank of at least Corporal. The minimum term of service is usually two years. Keep in mind these are just the basic requirements. The Swiss Guard selection process looks for candidates that show extreme dedication, physical prowess and higher education and military capabilities. 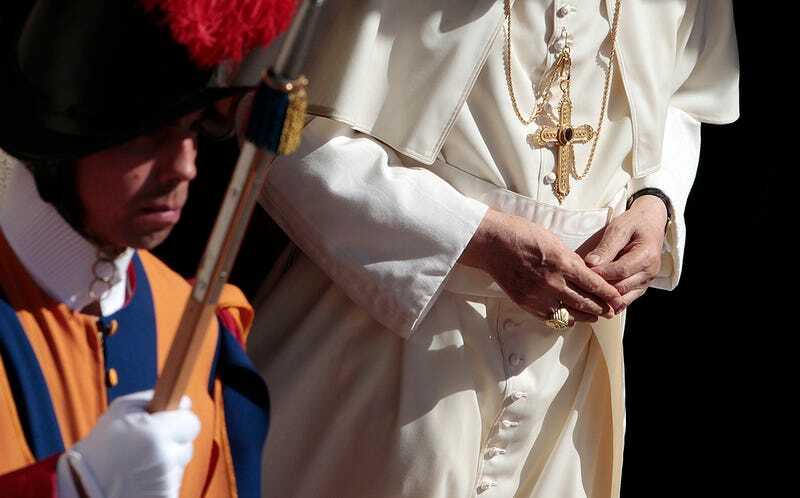 Once you are selected and prove that you meet the Swiss Guard’s standards, you are sworn in by the Pope himself, an event that occurs on May 6th of every year. Training includes crowd control, VIP protection, lethal and less than lethal weapons employment, surveillance and many tactics that the job requires. For the most part, the Swiss Guard live, work and play within the Vatican City State’s 110 acres. This includes living at a centralized barracks that has a mess hall, training and gym facilities which are located near the pontifical apartments. The unit has its own sporting teams and band. One of the most interesting aspects of the Swiss Guard is their armory, which is like no other in the world. It is more of a museum of the evolution of post-1500s European weaponry than anything else. The Swiss Guard has largely used anything the Swiss Army had at the time when they needed upgrades. Vintage armor and edged weapons — primarily the sword and the halberd dating back hundreds of years — are still used today and they are not for show. The Swiss Guard are trained how to use them under various circumstances, both ceremonial and the more deadly kind. Often times these weapons can be seen alongside Guard members wearing the aforementioned traditional “Gala Uniform,” which is the most complex of any military uniform currently in use in the world today when combined with ceremonial armor. When it comes to formal attire, they also wear much more subdued all blue uniforms or ones featuring a cloak during the cold, rainy months. In addition to uniformed men, many of the Swiss Guard’s force are in plain-clothes, usually wearing specially tailored business suits. The Swiss Guard is well aware that they have to stay up on the latest technologies to keep potential threats at bay. As such, they regularly modernize with the times, but they don’t really put any old gear fully out of commission either. They also employ Swiss T59 rifled muskets, Vetterli Model 1871 and M1867 rifles, Hisso MP43-44 sub-machine guns and Schmidt Rubin K31 bolt-action rifles. These are just a few models of vintage arms still in service with the Pope’s army. But don’t be fooled, there is plenty of very modern firepower as well. Although many would think the Vatican is protected by a token force of spear-slinging cosplayers, this is not the case. Although the Vatican does not like to discuss it, many plain-clothed officers are nearby the Pope when he is moving about. This especially includes when he travels abroad. These Swiss Guard officers pack the best weaponry available, namely tricked-out Heckler & Koch MP7 personal defense weapon (PDW) that fires armor piercing small caliber rifle rounds. This weapon is extremely popular with elite units ranging from SEAL Team Six to presidential protection units around the globe. It is also compact enough to be packed in an underarm-sling that can be concealed underneath a sport coat. As for sidearms, the service packed the ugly .32 caliber Dreyse Model 1907 pistol for nearly eight decades. After the assassination attempt on Pope John Paul II in 1982 this changed. The Sig P220 semi automatic pistol became standard issue for the Swiss Guard. The gun, which is made by famed firearms manufacturer Sig Sauer, has one of the best reputations for reliability and quality. (Today, the Navy SEALs are known for their similar Sig Sauer P226 pistols) The Swiss Guard also uses Austrian-built Glock 19 pistols for deep concealment that are specially engraved with Vatican seals and the letters AG, an abbreviation of roughly “Guard Property” when translated. For heavier hitting longer-range modern firepower, the Swiss Guard has an array of Sig SG550 series assault rifles in different configurations. This includes some with short barrels and folding stocks (Sig SG552 Commando) for close-quarters battle (CQB) and vehicle carry and others with longer barrels and scope setups for extended range engagements. The SG550 series fires 5.56X45 NATO cartridge just like the American M-16/A-15 family of rifles. You can see some interesting pictures of parts of the firearms section of the armory here. In addition to the Swiss Guard, Vatican City has its own police, known as the Gendarmerie Corps of Vatican City State. They help augment the Pontifical Swiss Guard during the Pope’s appearances, especially those in Saint Peters Square and abroad, as well as providing general security, traffic direction and investigative duties for the Vatican City State. This unit, which will be 200 years old in 2016, is roughly the same size as the Swiss Guard. The small but highly trained force includes a counter-assault team and a anti-sabotage unit which deals with explosive ordinance disposal (EOD). Think of them loosely as the Capitol Police while the Swiss Guard is like the Secret Service Protection Division, just on a much smaller level. The Gendarmerie Corps are equipped with a full range of modern weaponry, include Glock pistols and Heckler & Koch and Beretta sub-machineguns. Their tactical teams use Carbon 15 machine pistols and Heckler & Koch/FABARM shotguns. For the Pope’s recent and very high-security visit to the U.S., Dr. Domenico Giani, the Inspector General of the Vatican police and security, led the team. He is also Pope Francis’s personal bodyguard. He is usually seen off the front fender of the Pope Mobile during transits. When traveling abroad, the Swiss Guard and Vatican Police work closely with local police and military units to come up with detailed site visit plans, with plenty of contingencies in mind. Although every public movement of the Pope is controlled, Pope Francis is a wildcard and has largely disregarded past Pope security operating procedures. There’s no armor visible in the Popemobiles he currently uses: just a simple windscreen, possibly bulletproof, separating an open-air elevated cabin. Additionally, instead of an armored limousine, he has elected to drive in compact Fiat 500s or Ford Focuses with his window often rolled down. With this in mind, the Swiss Guard, Vatican Police and local law enforcement have the incredibly difficult task of stopping attacks before they occur. This was exemplified by the incredibly strict security during the Pope’s visit to Washington, New York and Philadelphia last week. The trip features security standards that exceeded that of even the President in some cases. This level of high-security actually troubled the Pope, who is known to run spectacularly off script. But the country that the Pope is visiting that has the ultimate say on how the security plan will go down, and the Secret Service, not the Diplomatic Security Service, largely ran the show outside of the Pope’s most inner ring of personal bodyguards. This included a full Presidential motorcade wherever he went as well as use of VH-3D “Marine One” helicopters normally reserved for presidential airlift duties only. Like so many things that are Vatican-related, the Pope’s army is an intriguing one. It is amazing how well the force has kept its cultural roots alive while still readying for the threats of that exist today. And it is those cultural roots that remind them that their job could turn into one of great sacrifice at a moment’s notice. That reality may be more relevant today than nearly 500 years ago when the Swiss Guard valiantly stood their ground long enough to see that the Holy Father survived. Non-embedded sources: Vatican, The Catholic World Report, Pontifical Swiss Guard, Guns.com, New York Times.